﻿ Is Cross Docking Viable for Your Company? Blog Home > Cross Docking > Am I Wasting Time: is Cross-Docking a Viable Consideration for my Company? In concept and on paper cross docking looks great, but, what about actual implementation? What kind of return do we get on this investment? The short answer is the implementation can be challenging. However, with planning, a committed team of upstream and downstream participants, and possibly even a pilot program, it can pay significant benefits. Cross docking does not have to be complicated. Some, even today, execute cross-docking using human-readable paper documentation as the driver. As mentioned in the original brief, cross docking can cover a wide range of distribution activities. In one door and directly out the other is one approach. Many cross dockers also add value in the brief (hopefully) interval between receiving and shipping. Others send product to a temporary buffer in the interval, in many of these cases an automated system (mini-load, AS/RS, etc.) serves as the buffer. What might we potentially expect from a successful implementation? What are the gotchas, why we might fail? To best manage your inventory, you really need visibility into what you will be receiving, before receiving it. Advance Shipping Notices (ASN) are what provide this visibility. Most of you are familiar with these, and probably already use them in some form. With ASN’s, you know what is arriving and when. With your Warehouse Management System (WMS) you know what is in your warehouse. Marry these with your order management system and you have the information necessary to match current inventory with order requirements, and get orders out the door efficiently (transportation covered shortly) You begin to see the need for cooperation and communication across the supply chain. The value (necessity) of EDI or internet connectivity becomes apparent. A level of information infrastructure is a must. Supply chain partners are just that, partners in an integrated cross dock process. Select those that deliver products frequently, and deliver them on time. Most of you already have a solid handle on who are possible vendor partners, those with whom you are currently highly collaborative. Those whose products require a very limited number of touch points in the cross dock, if any touch points at all. Touch points are work. Who does the work? Organizations that are process-driven, with a continuous process improvement mentality fit well in a cross dock environment. They tend to establish metrics, measure, and effectively use feedback for improvement. Those achieving high levels of efficiency will track and trace products throughout the entire supply chain to capture data which drives these improvements. Ongoing emphasis on training and education plays a key role. In our next brief, we will touch on transportation, and then move into facility layout alternatives, what works, what does not, and links to a couple of good case studies and online tools. You are welcome to e-mail me with any questions or comments. Resources for additional information on cross docking. Both are worth a look. 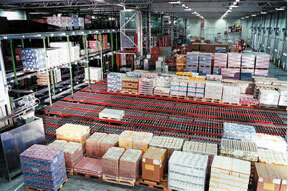 This article is part of a series of articles on Cross Docking. Click on a link below to view one of the other articles.